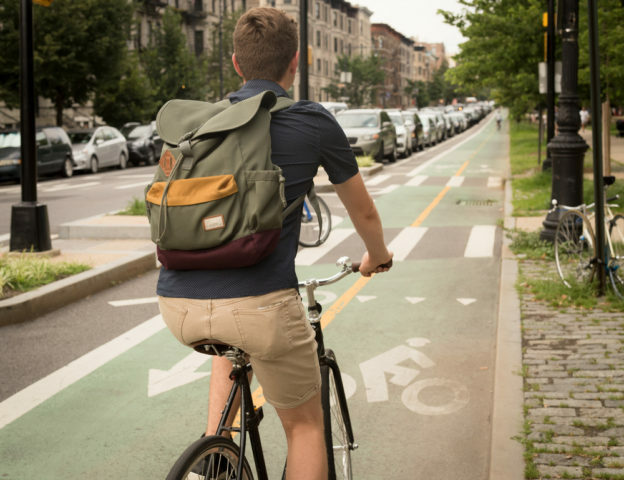 A year after its release, we wanted to call out 3 conclusions the City draws in this report that we believe are important for all NYC cyclists to keep in mind as they commute and tour around the five boroughs. According to Safer Cycling study, 89 percent of all cyclists killed and severely injured (KSI) occurs at intersections. Digging a little deeper, the study identified three common scenarios that have resulted in most cyclist fatalities. 29 percent of fatalities occurred when the bicyclist was traveling adjacent to a motor vehicle. In these scenarios, cyclists are at risk of “door prize collisions,” a term commonly used to refer to when a motorist opens a car door directly in front of a bicyclist, the bicyclist might not be able to stop in time and instead, can crash into the door. 27 percent of fatalities occurred when the cyclist was traveling at a right angle to a motor vehicle. In these scenarios, confusion of priority can often be the cause of the crash. Either the driver or the rider believe they have the right of way and collide in the intersection. 21 percent of fatalities occurred when a motor vehicle turns and collides with a cyclist. It is not uncommon for bike lanes to be to the left (or right) of the vehicle lane and the vehicles intersect the bike lane when making a turn. In many cases these intersections will have a separate bike and vehicle traffic light to better establish which lane has the right of way in hopes of minimizing confusion for both riders and drivers. Of course, there are other situations where a cyclist may be involved in an accident that could leave them seriously injured or results in a fatality, but this study effectively highlights situations where cyclists should be on high alert to avoid common accident situations. Bike lanes with green colored pavements, which increase the visibility of the lane, reinforce bicyclists have priority and discourage illegal and double parking. Buffered bicycle lanes, which have additional buffer space between the bike lane and the auto lane or parked cars. Cyclists may see these in NYC on high-volume avenues, or streets with high parking turnover. Bicycle boxes, which are green zones in front of the stop bar for cars and behind the crosswalk. These generally exist in high-trafficked intersections to give bikers improved visibility. Because of this, NYC DOT has been working towards expanding biker facility networks across all five boroughs to provide cyclists with safer avenues for travel. Specifically, they have been focusing their efforts on neighborhoods with higher than average KSI, which include 7 neighborhoods in Brooklyn. 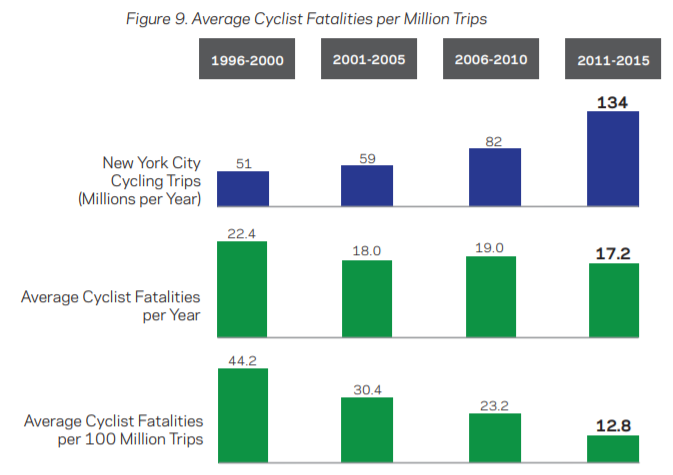 The provided graphic by the Safer Cycling study provides a relatively clear relationship between the continual growth of cyclists in NYC and the decline in cyclist fatalities per 100 million trips. Furthermore, as the study goes on to illustrate, this is not just a trend witnessed in NYC but a commonality in both United States peer cities (cities with a similar number of cycling trips in the reported time period) and in the United States as a whole. The hypothesis tied to these results is that with more cyclists on the road, not only is the city encouraged to expand the use of bicycle facilities (which as discussed above, seem to decrease the frequency of cyclist fatalities) but also drivers’ awareness of bicycles will generally increase, leading to more caution when they are close in proximity to cyclists and bicycle facilities. Being involved in a cycling accident can be a scary situation, particularly if a car or other vehicle is involved. Many injured cyclists suffer long-term injuries and must deal with lifelong changes to their lifestyle. If you or a loved one has been involved in a bicycle accident, seek legal help right away. There are many types of personal injury compensation that may be available to you. Contact the Law Office of Jeffrey K. Kestenbaum to protect your legal rights. Schedule a consultation today by calling (718) 237-5586.